In Mexico there is a unique three day festival called El Día de los Muertos or The Day of the Dead. I spent it in the southern city of Oaxaca - notable in Mexico for the strength of this tradition particularly in small indigenous communities. The key action happens in the cemeteries - of course there are street parties and a lot of people dressed as skeletons getting drunk - but to be honest in a big tourist town like Oaxaca that feels almost like any other night. I headed to Xoxoclan in the south of Oaxaca, a small town known to celebrate the event in style. Each family spends the whole night (theoretically) sitting around the grave of their deceased. They decorate the grave with huge numbers of flower petals, candles, photos, and whatever their loved one liked. Thus there are lots of sweets, and lots of mezcal - some people really settle into the night with it. The idea is that the decorations and lights attract the spirit of their loved ones who then come back to join the family for the festival period; as people drive home in the morning they scatter sweets out of the car window to guide their dead back to the home and family altar where it is said they will live with the family for the next two days. To me the sense of sharing in the memory of a loved one as ‘having them with you’ is not an idea I feel the need to get scientific about. Instead I tried to use it as an opportunity to understand another culture’s ritual for mourning, remembering and celebrating their dead: and overall I find it the healthiest attitude to death that I have ever come across. The advice I got for visiting was to take a bunch of flowers and always to greet the people I walked past (sometimes almost over their grave). This way I could always demonstrate respect by contributing a few flowers and asking polite questions about the dead. ¿Quien es enterrado aqui? [who is buried here?] was my key phrase for the evening. What I did not expect was the level of welcome that I received - especially once I had outstayed the tourist buses that were touring the area a cemetery at the time. People responded to my greeting and were often keen to talk about their dead grandparents, fathers, mothers, sisters, brothers, children, telling me what they did, what their passions were, sometimes giving me mezcal which more often than not was introduced as the favourite kind of the deceased. Thus the grave decoration became the way to ward off the graveside cold, and the act of remembering the passions and joys of the dead brought to life the passions of the deceased, that night in the cemetery. This kind of partying did not seem separate from the intention of the event - to draw back the dead to visit. What better way to recall a lost father then by sloshing around his favourite mezcal with your sisters, or how else to bring back a dead daughter then by singing her favourite songs in a guitar circle round her grave (this one was especially heart breaking). Maybe even the pot smoking teenagers were emitting a special incense to attract the spirit of a stoner - then again maybe not. I gradually realised that what I was witnessing was something I lacked a term for, this was not a funerary mourning; I imagine few people could sincerely grieve a long dead grandparent for a whole night. Likewise this was not a party, as witnessed by the lonely figures by long dead husbands or by large group around a recently lost child. Instead this was a group interaction with the dead and with each person’s own emotions. Decorum was not required for a sincere interaction; perhaps it would not even be possible for a whole night, every year. People chatted and drank and sang but whatever they were doing they witnessed the ritual, they were recalling the dead. That first evening was a moving experience, but what it really did was initiate me into the ritual, a whole new way of interacting with the dead. A recently dead friend or relative is often too painful an experience to comprehend fully - thus I feel like having a funeral a few weeks later is only part of the process we should embrace for remembering our dead. We should revisit them time and again, like the Mexicans do. This way we can organically tread the process from mourning to remembering and from remembering to celebrate their life. In this spirit I created my own shrine for my recently deceased friend on the second night of the festival. I built her an altar in the main, historic cemetery in Oaxaca, enclosed by a beautiful candle-lit cloister and centred with a ruined church. 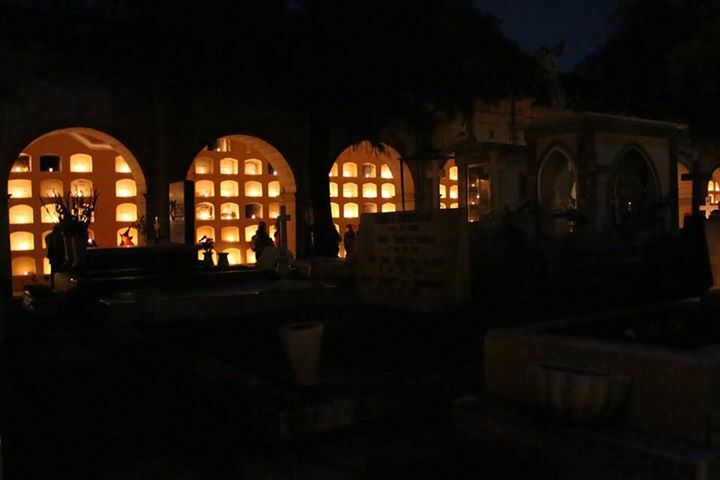 This cemetery had a lower density of mourners - though every grave had at least a few candles and some flowers even if it was only visited for a few hours. I picked my friend Violet a spot a near the action but not intruding on other mourners, a spot by a tree between two graves but within easy earshot of some music playing and the partying/chatting/mourning of a large family, two graves over to the left. I set up her photo, candles I had bought (in a huge queue for a tiny candle store) that day, surrounded it with flowers and constructed my own, Violet specific, decoration of a skull made out of cigarettes. I then proceded to sit and drink mezcal and smoke as if Violet was there - pushing them on me. And I was amazed by the number of people who came up to me, shared their mezcal, asked about Violet, asked about me, gave me food and invited me to their graves to meet their dead. The process, the planning, the constructing and the sitting in this beautiful place proved far more therapeutic than I ever had imagined it might be. More than just remembering, I found a peace with Violet, I let go of the more irrational feelings I’d been storing up. I forgave her for dying. And I began to really embrace some of clichés I’d been throwing around the funeral. That I am lucky to have known her. That I’m grateful for the time I had with her. I began to enjoy remembering her, through telling jumbled accounts of her to the Mexicans and tourists who chatted to me. I laughed with them about her. I laughed with her. Something about that place, about that shrine brought her back to me. I believe that the Day of the Dead does what it is supposed to do - bring the dead back to live among the mourners - not in a spiritual sense - but on an emotional level. It is of course an event for the mourners not for the dead. But when I left, the graveyard was closing and it was time to leave. I felt a wrench to leave her there, the only cure to which was to reflect that I could bring her back another year. Perhaps with my friends and the people who loved her we could come together to recall her together like the Mexicans do. Together we could share the way in which grief changes into remembering and maybe, truly, we could learn to celebrate her.